. These cities both submitted 3D models of their downtowns to Google via the Cities in 3D Program. In doing so, they joined others who view Google Earth as an effective way to promote their town to virtual tourists, enable potential businesses to evaluate a new site, and help city planners share design proposals with their communities in a way that we all can relate to: in 3D. Whether you're starting from scratch or have existing data to share, we have the resources for you to make your models available on Earth. For those of you who are new to this, Google SketchUp is free software that allows you to easily create high-quality photo-textured 3D models. If your town or city has already created models, you can share them with us in a couple of ways. Use the 3D Warehouse - our online repository for storing 3D data - to upload your textured or non-textured building models if you have fewer than 100 buildings. If you have hundreds or thousands of buildings, or if you only have building footprints with the height value, we're happy to take those in too! Just fill out our contact form and let us know what kind of data, how much and in what format you have and we'll get back to you with more info on getting your data in. If this sounds interesting to you, please contact us! We'd be happy to answer any questions you many have about the process. 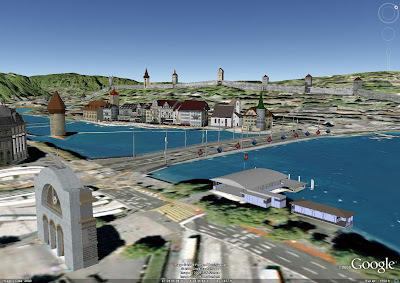 Lucerne, Switzerland and Santa Rosa, California have joined the growing list of cities and towns that have chosen to incorporate themselves onto the "3D virtual map" in Google Earth. 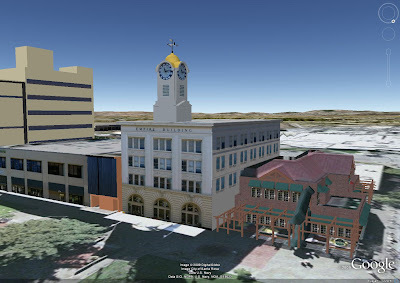 These cities both submitted 3D models of their downtowns to Google via the Cities in 3D Program. In doing so, they joined others who view Google Earth as an effective way to promote their town to virtual tourists, enable potential businesses to evaluate a new site, and help city planners share design proposals with their communities in a way that we all can relate to: in 3D.